Mori Chihiro proposes a critique of mainstream society’s rules by recombining fragments of Japanese urban life. The background here—a complex tapestry of guilloche patterns (intricately interlaced curves)—is taken from Japanese paper currency. On top of this colorful web Mori painted a sea of smiley faces that represent religious icons in the Sanjūsangendō, a Buddhist temple in Kyoto. The Sanjūsangendō houses one thousand life-size statues of the Thousand-Armed Kannon (a Buddhist deity embodying compassion). 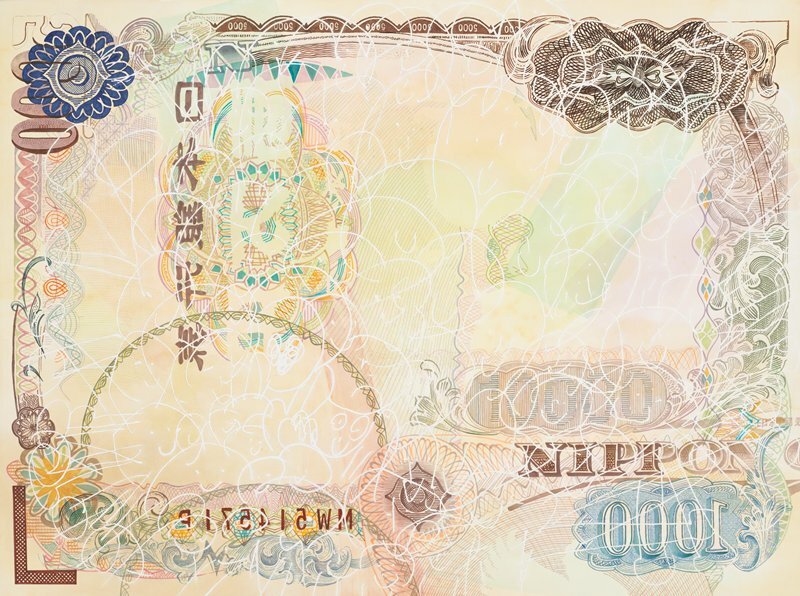 Mori playfully visualizes a clash of opposing forces—sacred (the Thousand-Armed Kannon) and profane (smiley faces and money), order (organized religion) and chaos (capitalism)—to express her frustration with cultural pressures to conform.